The marine theme servers carved in 2010 could be my most lyrical output to date. The new pieces carved in 2011 evolved from the 2010 forms, but on quite a different, more edgy tack. nice. 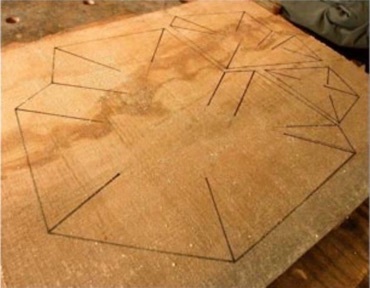 But the extra work involved -- maybe twice the effort compared to carving a bowl with rounded hollows -- is surely disproportionate to what is achieved. In any case, I decided to press onwards to see what happens when the hollow forms are created with straight elements. But please note. I did not go completely crazy. The junction of the interior walls and the bottoms of the hollows is still always rounded. Carving those reverse saddles in the 2010 pieces was already irrational. But they looked so nice!. And of course there are elements carried forward from the previous work. I very much like the idea that these some of these servers can stand up on their own. When not being functional servers of foods their sculptural presentation can also be displayed in a vertical mode. Upright, they require less space. But more important, I think they are viewed with a different kind of expectation and intelligence. Furthermore, I think it is more likely that the sides and bottom (now seen as the back) are possibly more likely to be appreciated compared to when the piece is flat on a table or display shelf. .
Use of some painted elements was also continued. 11-1 is the first and only piece to date with some coloration of the interior hollows. 11-2 combines some color and some stabilized bark on both sides. Again, using the polychromatic stippled acrylic techniques. .
During the work process there were other discoveries. The overall composition of the hollows began to take on a degree of unity that wasn’t as much of a concern in the earlier pieces. This is particularly strong with 11-3. 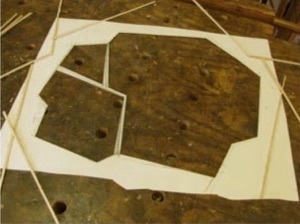 The cluster of three hollows visually join to create a unified irregular polygon. From the plan view everything is now straight. . In 2010 I used drafting flex curves as a design tool. This year I sometimes used narrow sawed strips of wood which could easily be broken into any length during the design process. Finding the right look for the dividers was particularly interesting. I found that these asked to be tapered, rather than parallel sided. .
Once again I’m trying to create something that could almost be natural (or found in nature) but which is obviously not so. These pieces are definitely man made. As always, there is a constant search for forms that are authentic. Just to add something else – maybe bewilderment, hopefully delight – I created a curved element for the arris of one side and the bottom of 11-5. This wasn’t my first piece with an exterior curve. Look back at 08-1,2,6 and 09-7. But it’s the first piece where a complex curve becomes a defining element of the overall composition. 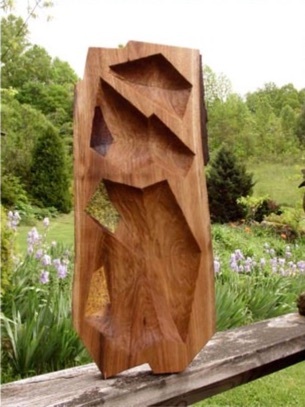 All of these pieces are carved from air-dried butternut and sassafras sawn planks. Except for 10-4 they have one or two natural waney sides. On blanks where the bark was intact I used thin restoration epoxy as a stabilizer. On sides where the bark is missing I’ve continued with multi-chromatic stippled acrylic painting. Three of these servers have titles. I call 11-3 Cracked Ice -- now the theme for 2011. 11-4 is Wood Crystals. 11-5 is Swedish Clock. Each piece is signed DL and dated ’11 using the kolrossing single knife cut technique and finely ground coffee as the end-grain filler. All of these pieces are finished with a 3:1 mixture of cold pressed flax seed oil and citrus peel solvent.